Have you decided to ditch the baby-faced look and go for a manly beard or moustache? If so, you're in luck. An advantage of keeping beards is that it helps keep your facial skin young and healthy .How? A study conducted by researchers from the University of Southern Queensland has found that having a beard blocks 90 to 95% of UV rays, thereby slowing the ageing process and reducing the risk of skin cancer .Additionally, they retain moisture and protect against the wind, keeping you looking young and fresh-faced at all times. 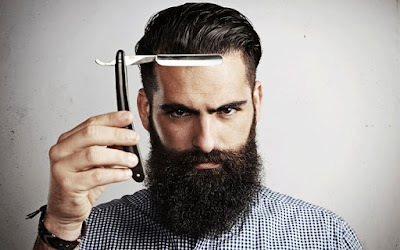 It’s relatively easy to grow and maintain facial hair as long as you know what you're doing. The following four secrets will help initiate you into the ways of the beard and the moustache, ensuring that every follicle of your facial hair is truly worthy of your face. Proper hygiene is the first step in beard and moustache excellence. Your facial hair should be washed along with the rest of your face, but you'll need to give it special attention. Beards didn’t get the nickname “soup catchers” for nothing, and in a worst-case scenario, an unkempt beard or mustache can become a breeding ground for unwanted organisms. Rinse your beard thoroughly to make sure no soap residue remains trapped in the hairs. Dry pat the hair as opposed to rubbing it dry, or you may irritate the skin underneath. Now that your beard is nice and clean, it’s time to add some moisturization. The skin underneath hair follicles tends to be more dry than bare skin, so applying moisturizer, face balm or oil twice daily will keep the dandruff away. Every part of your body needs vitamins, and your beard or mustache is no exception. Vitamin-rich foods, like fruits and vegetables, and supplements from places such as Beardvitamin.com can help your facial hair grow faster and stay strong. Omega-3 fatty acids also contribute to hair health, so don’t hesitate to stock up on salmon. Unless you’re deliberately going for the Grizzly Adams look, you’ll need to trim your beard regularly. Find a beard trimmer that has a decent length-cutting range, a safety guard and a definer that lets you get at those hairs around your lips. Never trim your hair when it’s wet; hair contracts when wet and expands when dry. If you cut it while it’s still wet, you might accidentally cut too much off. If you’re going the moustache route, you can opt to shave the rest of your face with a manual or electric razor and save the trimmer for your lip rug. There may be days when you don’t feel like giving your beard or moustache the treatment it deserves. You may just want to roll out of bed, give your facial hair a quick wash and head out the door. Resist this urge at all costs unless your house is on fire. In that case, run for it. Otherwise, take the time to properly care for your facial hair, and it will take care of your manly mug in return.